The Orlando trip has come and gone. Before we left, the Weather Channel reported there was a good chance for rain but we thought what’s a little rain and headed out anyway. First scheduled stop was Biloxi. Bad weather rolled into Baton Rouge about the same time we did and we experienced hurricane like blinding rain the rest of the way to Biloxi. In fact, the last hour we were forced to stop about every two or three exits making our 7 hour trip an 11 hour trip. The Weather Channel forecasted continued rain similar to what we experienced for the rest of the week so we made the executive decision to park the bikes and rent a car for the remainder of our trip. Yes, I said it … we rented a car. We had to be in Orlando for an event and couldn’t risk not making it in time due to weather conditions. I didn’t think to line my bags, which are not water proof, with plastic, which I used to do regularly, and a lot of my clothes got wet despite my lame attempt to protect the bags while parked. Tip from the Trip – Believe the Weather Channel. A little rain never hurt anybody but torrential rain can be dangerous. Don’t risk your safety and always be open to a change of plans. 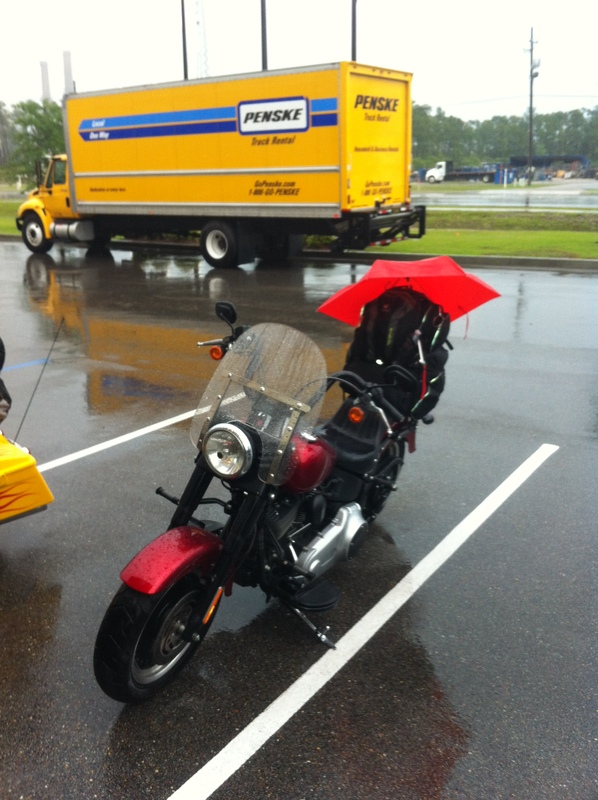 This entry was posted in On The Road Again and tagged motorcycle safety, motorcycle travel, Weather Channel, women motorcycle. Bookmark the permalink.